Swiss Chard is my favorite food. It's green, healthy and delicious. You can eat the whole thing- stems and all. It has great flavor and can be turned into anything, as you can see by this recipe for Swiss Chard Ravioli. I can't remember how I found this recipe but I knew I was going to make it as soon as I saw it. I love any take on Swiss Chard and this was something that I thought looked really original and interesting. The ravioli is made with wonton wrappers, which makes that part of the recipe much easier. 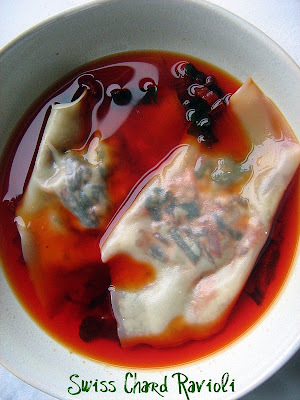 I decided to use water to seal my ravioli, instead of an egg-which the recipe suggested, simply because that is what I use to seal wonton wrappers when making pot stickers. I had one ravioli that exploded and I think looking back, using an egg would have been a better idea, since boiling the ravioli really spins them around a lot. The swiss chard is sauteed with a shallot and a little oil (the recipe used butter, but I avoid butter when I cook), and then mixed with some ricotta cheese, thyme, and fresh parmesan. That is what makes up the filling for the ravioli. Then the stems are boiled in some chicken stock, mainly to give the stock some color. The recipe said to drain the stems, but I left them in there, with a few of the leftover leaves and we ate them too. This was a fun twist of ravioli and a great new way to use swiss chard. I love swiss chard. I finally found someone that feels like I do!! Thanks for sharing. I mostly enjoy swiss chard now, but my sister and I despised it as kids. We ate it a lot when I was a kid, since we grew it in our garden. My Mom would soak it in a big tub of water before steaming it, but there would invariably be residual gritiness from hidden dirt=yuck! Anyway, when I saw your love of chard, I wanted to pass along an idea I tried at a cooking class last year. The instructor used giant chard leaves to wrap tamales (instead of corn husks). We just bundled the masa mix (plus sauteed mushrooms in our case) in a leaf, wrapped like a tight burrito. We steamed the tamales as usual and the taste was phenomenal. The chard was tender and added a wonderful, delicate flavor. If you grow chard and have a ton, it's a great, different way to use it. Anyway, maybe this is a typical use of chard, but it was new to me. Thanks for another great recipe! I have some swiss chard I got with my CSA I need to cook up. This looks great! My hubby has recently decided he loves chard, I'll bet he would really enjoy this.